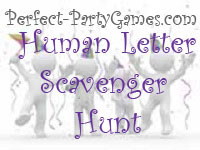 Summary: The Human Letter Scavenger Hunt is a photo scavenger hunt where the team members form letters using only their bodies in front of local establishments. 1. No laws may be broken while taking the photographs. 2. The team driver must put his/her driver's license in a sealed envelope before the team leaves home base. The envelope is placed in the glove compartment of the vehicle. If the envelope is open when the team returns, the team is disqualified. Essentially, if the driver gets pulled over for a traffic violation, then the envelope would necessarily have to be opened. 3. Each team must take a picture of team members forming a human letter in front of a local establishment where one of the words begin with each letter of the alphabet. The same place can not be used for two different letters of the alphabet. For example, Burger King could not be used as the B AND the K entry. But any word in the name of the location is acceptable. For instance, the San Diego Zoo could be used for the letter S, D OR Z. 4. In the case that no location could be found for a particular letter, then a picture can be taken in front of a place whose name CONTAINS that letter. An example of this would be using Pizza Hut as the letter Z OR U. 5. At least two members of each team must be used to form the human letter. For example, the girl forming the letter T in the photo of the word TEAM as seen above is an illegal formation. The remaining three letters are legal formations. 6. Each team member must appear in at least 3 photos or the team is disqualified. 7. Teams must return to home base within the time limit. 1. Each team gets in their vehicle. The driver seals his/her license in an envelope. 2. The teams leave home base and may begin writing down ideas of local places on their Alphabet Idea List. 3. The team then goes to any place on their list. When the team gets there, they are to form a "human letter" the same as the letter they are trying to obtain. For example, if the team needed a letter M, they could go to McDonalds. They would then form the letter M using their team members in front of the restaurant. 4. Continue taking pictures of human letters around town. Be sure to watch the clock as every team needs to return to home base at a specific time. 1. Each picture of a human letter is worth 8 full points if the photo contains the human letter as well as the name of the place in the background. 2. If the human letter photo couldn't be taken with the name of the establishment showing, a second photo can be used to prove location as long as a team member is in the second photo. This photo combination is worth 6 points. 3. If the human letter is formed in front of an establishment that only contains the letter of the alphabet, 4 points are awarded. And only 2 points for a photo combination as explained above. 4. Each team must be back at home base within the time alloted or 1 point will be deducted for every minute late. 5. Any team that has not followed Rule #6 is disqualified. The team with the most points at the end of the scavenger hunt wins.